Editor's Note: Like Chief Investment Strategist Alexander Green, Matthew is away this week sailing the ocean blue on The Oxford Club's Chairman's Circle Wealth Cruise. 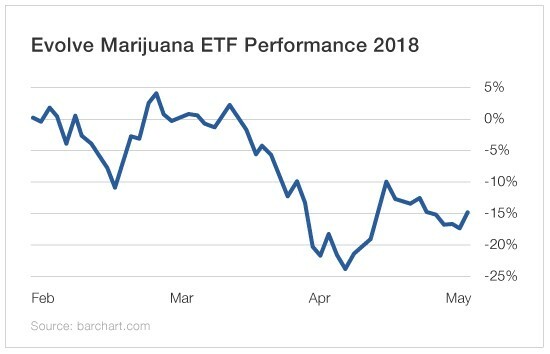 So it's a great time to borrow an article he recently wrote for Energy & Resources Digest on the new category of marijuana ETFs. It's also a good (albeit bittersweet) time to let you know that Matthew will soon be bidding bon voyage to the Investment U e-letter. It's not because we don't love and value him. I will personally miss our weekly banter about Elon Musk's latest boneheaded move, traditional brick-and-mortar retailers who can't adapt to the new world order and which 90s song lyric would most resonate with you. And don't worry. You'll still be able to follow Matthew's latest take on marijuana, manufacturing, metals, oil and the markets (did I mention marijuana?) for free in Energy & Resources Digest. But as I've mentioned the past two days, exciting changes are coming to your daily Investment U subscription. We'll invite Matthew back from time to time. But until then, let's just say "See ya when we see ya" - like next Wednesday when he gives you his parting "Peace out." I was shocked last week when someone complained to me, "There isn't even a marijuana exchange-traded fund!" I sighed. They were right. Because there isn't one. There are four! Admittedly, two just launched in February. And one is a converted Latin American real estate ETF. But this illustrates how much investors still have to learn about the cannabis market as well as how quickly it's evolving... not to mention how far removed it is from the mainstream. So today we'll delve briefly into the four marijuana ETFs and their differences. They each have their pros and cons, despite sharing several positions. But in the volatile world of pot investing, these basket opportunities can offer a less risky approach. 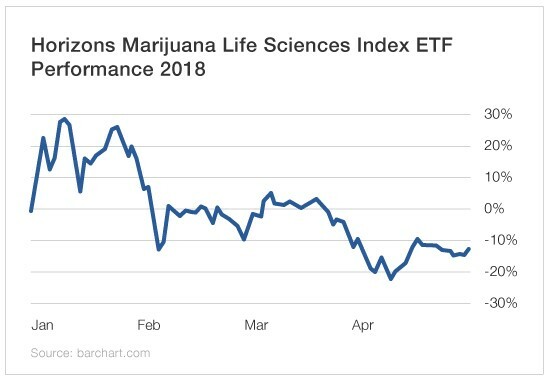 The Best Way to Play "Big Cannabis"
The Horizons Marijuana Life Sciences Index ETF (TSX: HMMJ; OTC: HMLSF) was the first marijuana ETF. It includes Aurora Cannabis (TSX: ACB; OTC: ACBFF), Canopy Growth Corp. (TSX: WEED; OTC: TWMJF), GW Pharmaceuticals (Nasdaq: GWPH), MedReleaf (TSX: LEAF; OTC: MEDFF), Scotts Miracle-Gro (NYSE: SMG), Aphria (TSX: APH; OTC: APHQF) and Cronos Group (Nasdaq: CRON). It focuses on the large cap - or "Big Cannabis" - players. That means its top holdings include the household names of the industry. It gives investors exposure to some of the largest licensed producers in Canada, such as Cronos, which was the first pure marijuana play to be listed on a major U.S. exchange. Those companies represent 66.28% of the ETF's holdings. And of Horizons Marijuana's 37 positions, 79.6% are in Canada, 12% are in the U.S. and 7.5% are in Great Britain. You also get a biopharmaceutical with GW, which happens to be the largest component of the U.S. Marijuana Index. GW's cannabidiol epilepsy treatment, Epidiolex, is a groundbreaker for the medical cannabis industry. It not only has a favorable recommendation from the FDA but could potentially bring in $1 billion in sales per year for the company by 2022. Then there's a classic fertilizer play with Scotts Miracle-Gro. Investors can't overlook the fact that all of the licensed producers in the Horizons Marijuana ETF are big international players with very limited exposure to the tumultuous U.S. market. So it's a solid basket of companies. It's been a tough few months for the industry. But in comparison, the U.S. Marijuana Index is down 14.9% year to date, while the Canadian Marijuana Index is down 23.2%. And the North American Marijuana Index, which is Horizons Marijuana's benchmark, is down 20% so far in 2018. Similar to Horizons Marijuana, the Evolve Marijuana ETF (TSX: SEED) puts a lot of emphasis on Big Cannabis. The largest of its 25 holdings are Canopy Growth Corp., Aurora Cannabis, MedReleaf, Aphria, Cronos Group, CanniMed Therapeutics (TSX: CMED; OTC: CMMDF), Hydropothecary Corp. (TSX-V: THCX; OTC: HYYDF) and Emerald Health Therapeutics (CNX: EMH; OTC: EMHTF). Those companies account for 62.7% of the ETF's holdings. For pot stock investors, two attractive markets right now are Canada and Australia. Evolve Marijuana focuses on both, with 92% of its holdings in Canada and the other 8% in Australia. It trails Horizons Marijuana by just a couple percentage points... and it launched only in February. That's due to the increased focus on Canada. 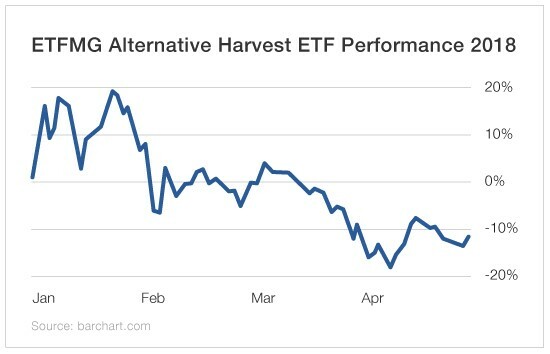 In December 2017, the ETFMG Alternative Harvest ETF (NYSE: MJ) converted from focusing on Latin American real estate to marijuana stocks. It's built slightly differently than the two previous pot ETFs. Its top holdings are GW, MedReleaf, Hydropothecary Corp., Cannabis Wheaton Income Corp. (TSX-V: CBW; OTC: CBWTF), Canopy Growth Corp., CannTrust Holdings (TSX: TRST; OTC: CNTTF) and Emerald Health Therapeutics. Those companies account for only 39.14% of the ETF's total holdings. Of the pot ETFs, it's the best performer. It's buoyed for now by GW and those international tobacco holdings. 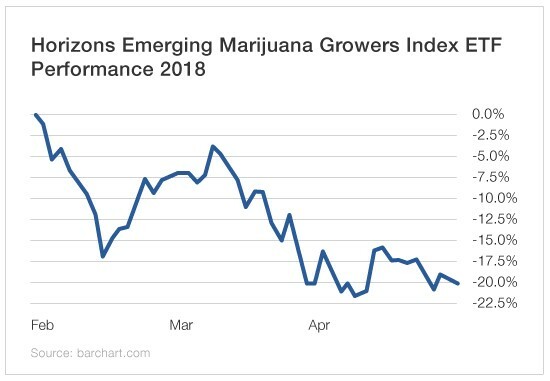 The Horizons Emerging Marijuana Growers Index ETF (NEO: HMJR; OTC: HZEMF) focuses on growth. As the name suggests, it's a basket of cannabis stocks in emerging markets. 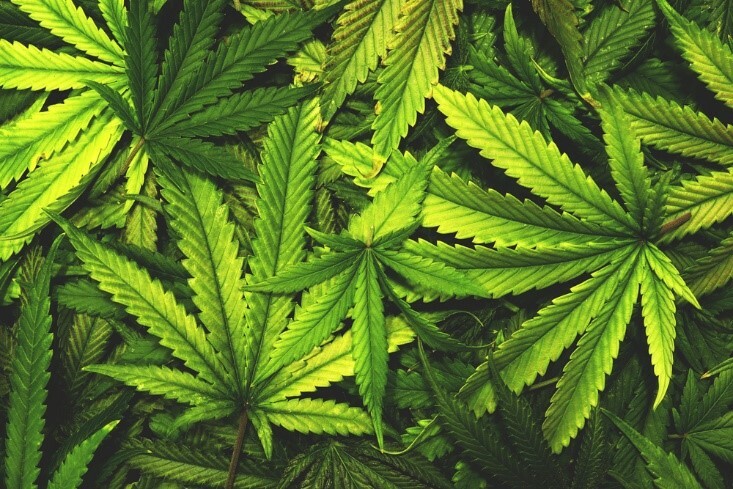 For example, the ETF's two largest holdings are Cann Group (OTC: CNGGF) and AusCann Group Holdings Ltd. (OTC: ACNNF) - the two biggest cannabis companies in Australia. Despite that, the ETF's composition by country is 79% Canadian and 21% Australian. There are only six publicly traded Australian pot stocks. Again, Canadian stocks have struggled in recent months. And after a strong rally to start the year, Australia's notable licensed producers have cooled off. This is an exciting year for pot stock investors. The market hasn't gone mainstream yet. Recreational use in Canada will go live nationwide in the coming months. Australia has approved exports and medical use and is already receiving shipments from Canada. In the U.S., recreational markets will be legalized in more states this summer, following the launch of California's adult-use market back in January. For investors looking for a one-stop shop for pot stocks, there are now four different ETF flavors to choose from. And they're perfect for those who want an alternative to the volatility of a single-stock approach. Later this year, Canada will legalize adult use of cannabis nationwide. The potential market in Canada alone is worth $22.6 billion. But the opportunity is beyond that... It's global. There are more than two dozen countries that have legalized marijuana use in some form or another. And even though marijuana is still illegal at the federal level in the U.S., nine states and the District of Columbia have given the greenlight to recreational use, and 29 have laws allowing for medical use. By 2024, the global legal cannabis market is projected to be worth $63.5 billion. And I believe by 2030, the total global cannabis market could be worth as much as $200 billion. And that's assuming a compound annual growth rate of 18% to 21%. So this is a very exciting moment in history. And there are several cannabis plays that I believe will be quite profitable. This year, Cronos Group (Nasdaq: CRON) became the first pure marijuana play to be listed on a major U.S. exchange. Cronos is a licensed producer in Canada. Its brands include Peace Naturals and OGBC, and it owns a stake in Whistler Medical Marijuana Company. Peace Naturals also just launched its line of cannabis oils. This is vital for any cannabis company because not only do oils demand a higher price and have better margins but sales of cannabis oils through Health Canada have increased more than 500% from the first quarter of 2016 to the third quarter of 2017. And shipments are now higher than those of dried cannabis flower. For Cronos, cannabis oil sales now account for 21% of direct-to-consumer sales. And in December, the company's oil sales increased 257% month over month. But Cronos also has distribution platforms in Australia, Germany and Israel. And its partner in Israel is already exporting cannabis to dozens of countries. In the fourth quarter of 2017, Cronos reported revenue increased 274%. For the full year, revenue surged more than 630%. But as we can see, this is just the beginning of a massive surge in revenue. In fact, revenue will increase more in the next couple of quarters than it did in all of 2017. Now, a lot of cannabis stocks have been hit hard over the past couple of months. Shares surged on California's legal adult-use sales launching January 1, as well as Australia's approval of cannabis exports. But there have been some regulatory hiccups with those California sales. And Canada was originally supposed to go live with recreational sales nationwide on July 1, but it looks like that might be pushed back a couple months. Shares of Cronos Group are more than 41% below their 52-week high of $10.39. Shares have a price-to-book ratio of 17.24, which is higher than its peers. But Cronos' price-to-book ratio is less than half its peer average. And the company has better profit margins and operating margins than its peer average.